Anyone who knows me well, knows my perfect comfort food is chicken. Almost every Sunday, I roast up a whole bird or bone-in breasts with enough leftovers for the coming week for sandwiches and salads. Boiling the carcass makes for a rich, meaty broth. 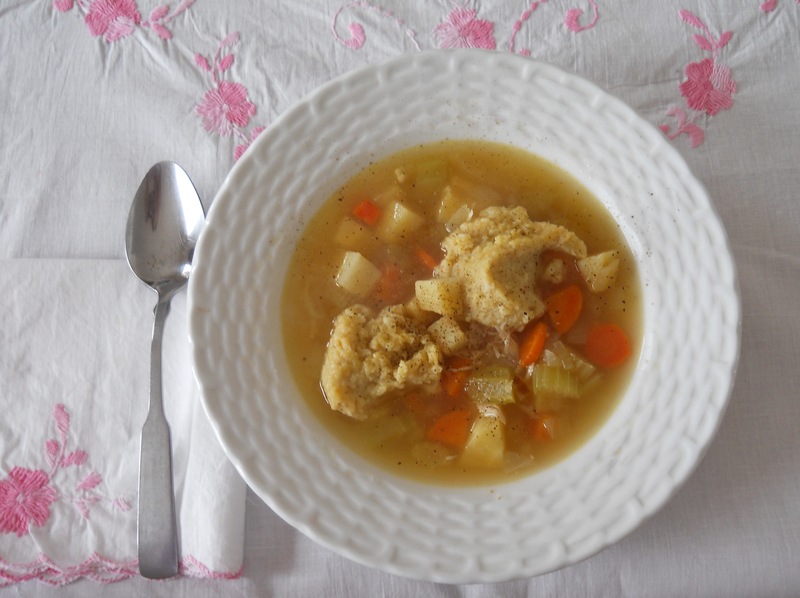 So when the weather outside turned frightful in early March, I decided with some sad vegetables staring at me from the refrigerator bin and some matzo meal in the cupboard, that it was a perfect time to make some matzo ball soup for lunch. You can use any variation of vegetables you like, I happened to have a half dead turnip leftover. Served with an orange and a couple of Thin Mint Girl Scout cookies made a perfect lunch and gave enough stamina to continue shoveling through the afternoon! 1. Heat broth over medium heat, add splash of wine and pressed garlic and stir. 2. In a medium skillet, heat olive oil. Add carrots, turnip, and celery with a dash of salt. Cook until softened. Add onion and cook until soft. 3. Add vegetables to soup and stir. 4. Form matzo into round, 1 tbs. Balls and place on top of the soup. Cook until cooked through, about 20 minutes. Serve and enjoy! Beat the eggs, blend the eggs with the oil, matzo meal, and salt. Add broth or water, mix until uniform. Refrigerate for at least 30 minutes. Add to soup as described above.